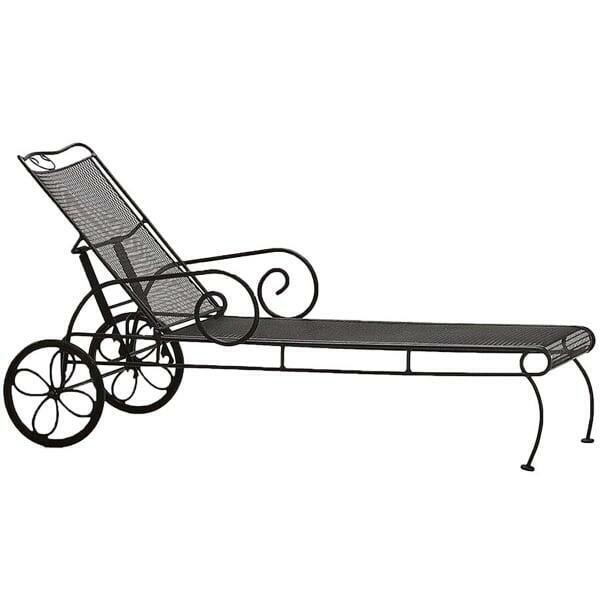 Timeless, elegant and made from traditional wrought iron, the Cantebury Chaise Lounge offers modern outdoor function combined with antique style. Woodard was inspired by classic wrought iron garden seating from the history of patio furniture when designing this chaise lounge, with circular arm supports and a beautiful rolled motif in the cresting at the top of the backrest. And while the style is traditional, you will discover this collection can be used in virtually any setting; Woodard follows construction with a multiple-stage finishing process that adds ionized layers of rust inhibitors, color and a sealer for safe, all-weather use. Imagine two of these chaise lounges placed next to your swimming pool, allowing multiple seat positions along with providing an authentic, antique look. W 30.5" x D 69" x H 23" SEAT HEIGHT 16.5"